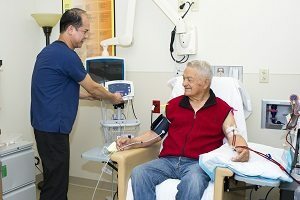 The Kidney Clinics at University of Colorado Hospital offer a variety of nationally- and internationally-recognized expertise on kidney diseases and hypertension. All of our clinics on the Anschutz Medical Campus in metro Denver deliver exemplary care for the treatment of a wide range of kidney conditions. 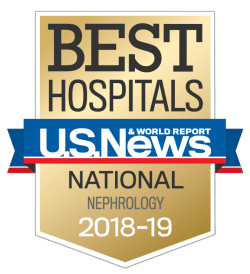 In addition, UCHealth University of Colorado Hospital is an internationally recognized leader in kidney transplantation and in-home dialysis modalities including peritoneal dialysis. In our practice, we recognize the importance of patient education and empowerment. Our team provides classes for education on chronic kidney disease, dietary counseling and recommendations tailored to your condition and diet, in addition to psychological and financial counseling. We work with several other disciplines to ensure you receive the best care possible. Our providers are well-recognized nationally and internationally for their research on hypertension, diabetic kidney disease, chronic kidney disease and its complications, glomerulonephritis, and cystic kidney diseases such as autosomal dominant polycystic kidney disease. Because of this, our clinics offer a uniquely individualized approach to your treatment with the opportunity to participate in several clinical trials.